San Francisco's ace lefty is hardly a likely candidate to follow someone else to the mound who works the first inning. 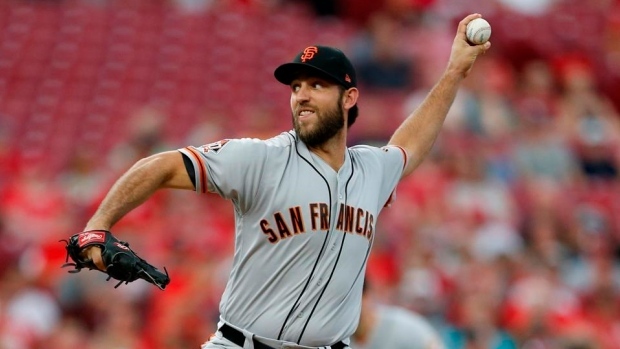 "If you use an opener in my game, I'm walking right out of the ballpark," Bumgarner wrote in a text to Bochy after new team president of baseball operations Farhan Zaidi said in December the Giants were open to the idea. "Everybody in this clubhouse knows what kind of teammate I am," Bumgarner said. "Some people may have forgotten that. Not in here. Outside, according to all this being talked about right now with that junk. It's OK. All I care about is the guys in here, and that's it. When it comes to the stuff on the field, I think they all know what kind of teammate I am." "Like Bumgarner said, of course you're not going to do it with him," Maddon said. "You're not going to do it with Jon Lester, you're not going to do it with probably every guy that we have." Then Bumgarner broke the pinkie on his pitching hand when he was hit by a line drive from Kansas City's Whit Merrifield in his final 2018 spring training start, undergoing surgery to insert pins into the finger. He returned in June and wound up 6-7 with a 3.26 ERA in 21 starts and 129 2/3 innings. "I've already done that," Bumgarner said of looking toward this season and not behind. "Especially last year. The first one I could have made a better decision. Last year, that's part of the risk you take standing that close to the hitter. I'm not living in the past, I'm not living in the future, I'm living today. That's what I do." He takes more time off during the winter than most, about six weeks, and doesn't throw off a mound until he arrives at spring training — something he learned from former Giants pitcher Matt Cain when he came up to the big leagues. Bumgarner begins throwing six weeks ahead of camp. "It just makes sense. There's no need," Bumgarner said. "If you're using spring training to get ready for the season then why not use it to get ready for the season." Last month, Zaidi hired pitching analyst Matt Daniels. Bumgarner might not be the first to reach out. He calls himself "old school" yet also open to new information. "The thing about Madison, this guy's always trying to get better," Bochy said. "He does a lot of self-teaching, but he listens, he talks to other players along with of course our coaches. He's got a knack of figuring it out himself how to get better. He's open to suggestions." In April 2012, Bumgarner signed a $35.56 million, six-year deal through 2017 that included $12 million club options for both 2018 and '19. The Giants exercised his $12 million contract option for this year, if San Francisco fails to contend the Giants could consider trades this summer. "I haven't thought about that," catcher Buster Posey said. "I sure hope we're in a position where it's out of the question, that's what I hope is the case and hopefully I don't have to think about that."